Why do I have this feeling that my kids would make fun of this photo? The kids have been teasing me whenever they see this picture in my folder. They said I really need to lose weight because they notice I was panting while climbing the steep stairs at Eco Park. The stairs will lead you to the La Mesa Reservoir. Judging on this photo, don’t you think I should get serious in losing weight? Can you suggest diet pills for women that really work? 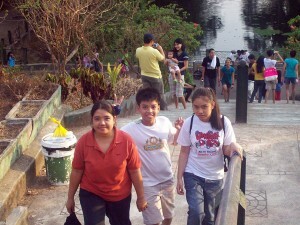 This entry was posted in Tourists destination and tagged La Mesa Eco Park, La Mesa Reservoir on February 26, 2011 by Yami.